Looking to find your way around Union Square? We've compiled transportation and parking information to make your next visit an easy one. 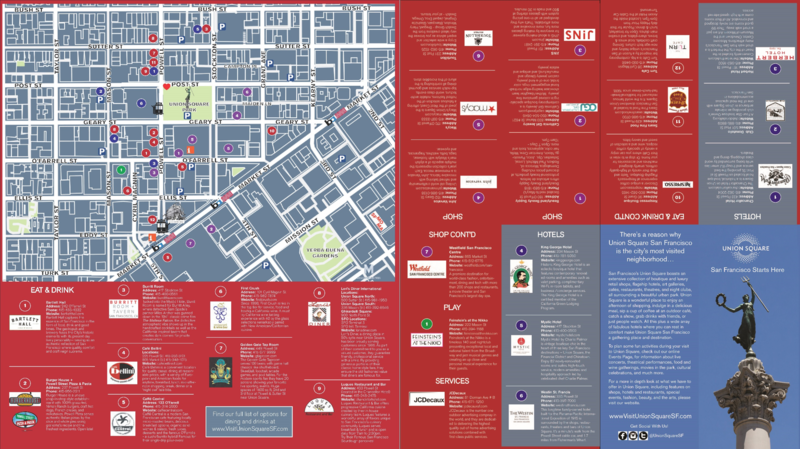 Click here to download the 2016 edition of the Union Square Map. Union Square offers a wide variety of parking garages within and surrounding our district. Once you've parked, it's very easy to get around on foot. Parking is easy and convenient in Union Square. Below is a list of local parking garages and rates. For a full list of city garages and info visit: SFPark.org. You can also download their app to check parking availability and rates. For private, reserved parking, we recommend you check out ParkNow. Please note there are several valet options as well, including a special valet program at Neiman Marcus and at the White House Garage. Union Square is a short walk from Yerba Buena Gardens, San Francisco Centre, Chinatown, the Theater District, Nob Hill, Lombard Street and more. You can walk a little further to North Beach, the Ferry Building, the Embarcadero and Fisherman's Wharf or they are easily accessible by Street Car or Cable Car. Take the Fremont Street exit to Mission Street. Turn left onto Mission Street. Turn right at Third Street. As you cross Market Street, make a left onto Geary Street. Stay on Geary Street and as you cross Stockton Street, Union Square Park will be on your right. Continue left onto 101 South off the Golden Gate Bridge. Make a slight left onto Lombard Street. Turn left onto Post Street and as you cross Powell Street, Union Square will be on your right. When heading on 101 North towards the Bay Bridge, take the 4th Street exit. Follow one block ahead and take a left at 3rd Street. Crossing over Market Street, make an immediate left onto Geary Street. As you cross Stockton Street, Union Square will be on your right. BART station in Union Square will take you to the East or South Bay. The most iconic form of transit in the city, these will take you from the foot of Market and Powell Streets to the north side of the city near Fisherman's Wharf and Ghirardelli Square. Where to catch: Along Powell Street at several stops. The MUNI trains run above and underground throughout various parts of the city. MUNI+ is a mobile app available for Android and iPhone to help you get around. MUNI buses supplement the MUNI trains with routes all over SF. Where to catch: several stops in Union Square. If you wish to visit the South Bay, connections are available from the T Muni Train and Muni Buses. Where to Catch: In SOMA at 4th and Townsend St.
Amtrak trains with connecting service to Amtrak Thruway buses reach more than 90 destinations in the California. Where to Catch: The San Francisco Shopping Center Amtrak Thruway Bus Station. Taxis can be tough to catch in SF – we recommend you stop by one of the major hotels to ask them to hail you a cab. The number for Yellow Cab is: (415) 333-3333 and their website can be found at www.yellowcabsf.com. Full list of taxi companies. Ford GoBike is the Bay Area’s bike share system, with hundreds of stations and thousands of bikes including new pedal assist ebikes available exclusively in San Francisco. Lyft is a mobile app that allows you to do peer to peer ride sharing. For more info download the app or visit Lyft.me. Uber is an on-demand private driver service. For more info, download the app or visit uber.com. Parking is easy and convenient in Union Square. Below is a list of local parking garages and rates. For a full list of city garages and info visit SFPark.org. You can also download their app to check parking availability and rates. For private, reserved parking, we recommend you check out ParkNow. Please note there are several valet options as well, including a special valet program at Neiman Marcus and at the White House Garage. Located just South of Union Square, this garage provides easy access to Union Square and the Westfield San Francisco Centre as well as 4th Streets many hotels, restaurants and shops. For all those who have electric vehicles, the 22 4th St. Garage has one charging station. Conveniently located in the heart of downtown SF, this full valet service, 24/7 garage is steps away from Chinatown, Nob Hill, the Financial District, and Union Square, San Francisco's most recognized fashion, travel, dining, and theater destination. The 450 Sutter garage has been serving Union Square since 1929. Centrally located in the heart of San Francisco’s Union Square District, the Ellis-O’Farrell Garage is a ten story, City-owned public parking garage committed to the community and providing inexpensive rates for visitors to the area. With entrances off both O’Farrell and Ellis Streets, they are conveniently located when visiting Union Square to shop, dine, enjoy a show or just to take in the excitement that is only found in Union Square. The garage offers five pay stations as well as friendly cashiers, electrical charging stations and ATMs. Disability access parking is available on all levels, close to elevators. The Ellis-O'Farrell Garage has two charging stations for anyone with an electric vehicle. Located just off of Union Square Park, the Marriott Hotel is a CityPark garage that is open to the public. The Marriot also has two charging stations for anyone with an electric vehicle. Located in Union Square's renowned theater district, the iconic Mason O’Farrell Garage is home to five national car rental agencies, two restaurants, specialty retail, and, of course. a secure 24/7 parking garage. The Garage offers competitive daily, monthly, and special parking rates for downtown workers and has 1,100 parking stalls. Located just above Union Square Park with easy access to all of Union Square's fabulous shops, restaurants and entertainment venues, this is a City-owned garage that offers parking for visitors and local workers. Anybody with an electric vehicle may charge their car at any of the six charging stations on the first floor and the two on the second floor. The Union Square Garage is located in the heart of Union Square right under Union Square Park. When it was built in 1941, it was the first underground parking garage in the world. Today, it offers a convenient and central place to park for visitors to the Union Square area. Entry is on Geary St. between Powell and Stockton St. Anyone with an electric vehicle may come charge their car at one of Union Square Garage's five charging stations. The 5th and Mission Parking Garage is the City's largest and busiest parking garage, encompassing a full city block. It is conveniently located just south of Union Square within walking distance of the vibrand neighborhood and just across the street from the Westfiend San Francisco Centre. Union Square offers a wide variety of parking garages and within and surrounding our district. Once you've parked, it's very easy to get around on foot. The key to parking in Union Square is having a plan! Pick one of these parking lots or reserve a spot in advance, and you'll be all set. It can be difficult to find on street parking, but if you want to go for it, we do suggest using SFPark.org to help you find the best spot.